You may recall I posted the lineart for a pin up I did for an upcoming issue of Mice Templar. The art is going to accompany a written piece about the fall of the Knights, and their connection to the belief in the number 13 being unlucky. Here's the final version of that piece. 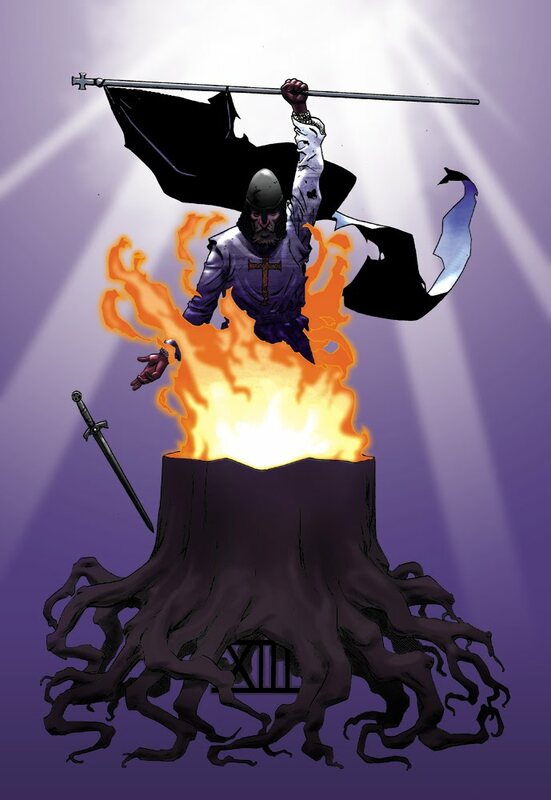 If you're not doing so already, you should check out The Mice Templar. Beautiful work from Mike Oeming and Bryan Glass. A true labor of love from these guys, and worth your time. Wow...the coloring on this is pretty tight. Think that is the highlight of the image. Good coloring can go a long way to make an image incredible. Bad coloring can ruin something really, really fast. Exactly. That's why good colorists are so respected, and sought after. I love guys like Dave Stewart, Matt Hollingsworth, and Nick Filardi.